In this case you have a possibility to build a so called splash page from which you send the visitors further on. Some traffic exchanges offer this possibility inside their member area as a free service for members. These splash pages are usually very simple, you can make them quickly. But you cannot apply a lot of your creativity. If you want to have a splash page different from others, more original and eye-catching you have to use a special service. There are more of them online – I would recommend AdKreatorThis program offers you not only building of splash page but also banners of different sizes, buttons, squeeze pages etc. And of course last but not least – splash page has a plus that it is simple, not much text – and therefore it is especially good for those traffic exchanges which show the pages only for 10 seconds for instance. In such a short time visitors cannot consider a long and detailed information. 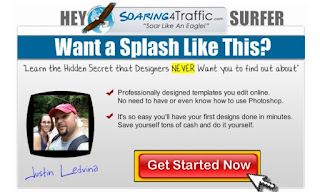 Traffic Exchange with useful tools like: page creator, rotator and tracker. More about Hungry For Hits…. TRACKING – Apart from advertising, Hungry For Hits offer extensive tracking tools and a site rotator service which is completely free! EASY TO USE – Hungry For Hits is one of the most professional traffic exchanges, but there are simple step by step instructions for everything if you need it. BRANDED – Brand yourself and your business to increase your trust and recognition easily with Hungry For Hits social tools and features! FUN – Do you find surfing for credits boring? We have a social platform and many unique mini games to make surfing fun and keep surfers alert. TARGETED – You’ll only get live, real-time targeted traffic from Hungry For Hits, with real people visiting your site. You can even talk to them in our chat! PAGE CREATOR – We offer a free Page Creator where you can make your own ads and brand yourself. Hungry For Hits even hosts it for you!